A lot of WordPress themes use featured images for certain theme elements like post thumbnails or image slideshows. Our themes usually define several image sizes for the featured images. WordPress will crop your uploaded image to all these sizes when you set a featured image. The theme will then use these different sized images on various locations in the theme. For example: You upload and set a featured image of 1024 x 800 pixels. From that image WordPress generates a thumbnail image with 85 x 85 pixels for archive pages, a 160 x 160 pixel image for single posts and a 800 x 400 pixel image for the featured posts slideshow. 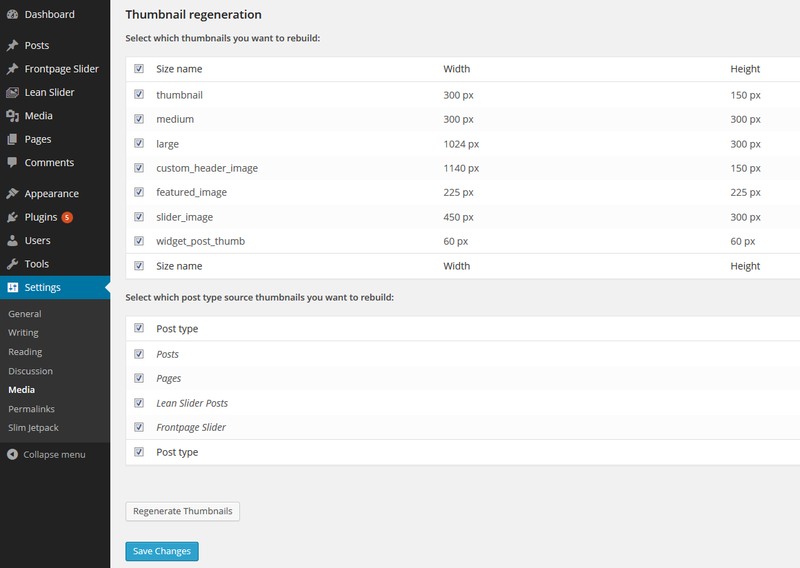 You can change the default defined image sizes with the Simple Image Sizes plugin. You can download the plugin on wordpress.org/plugins/simple-image-sizes or simply search for Simple Image Sizes on Plugins → Add new in your WordPress backend to install the plugin. After you have installed and activated the plugin, you will find additional image size settings on Settings→ Media. They are added below the default Media settings of WordPress Core. WordPress does only generate the image in different sizes when you upload an image. Therefore you have to generate your existing featured images after you have changed any image size.